Everyone knows to look for free boxes at the grocery and liquor store. However, you could also look on Craigslist. 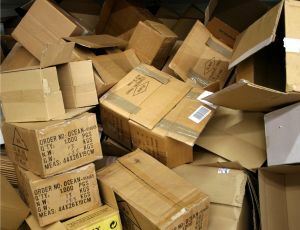 Many people are happy to get rid of the boxes from their move as long as you pick them up. You could also put out the call out on Facebook to ask your friends if they have boxes. Any free box is much better than one you have to pay for. The biggest complaint from professional movers is large boxes packed with heavy items. They are very cumbersome and can often break in the bottom. The big boxes are best for light things such as pillows and linens. Use smaller boxes for books and other heavy objects. You might have to utilize a lot of small boxes but it’s much better that way. If you’re loading up your own truck, then want to make sure you pack the heavy boxes first. They should all go towards the front of the truck for balance. There shouldn’t be any empty space in a box. Even if something isn’t breakable, you don’t want it banging around. Fill in the empty spaces with packing paper or some of your own clothing and towels. This also helps with balance when you’re stacking boxes. While it is true that everything is going to the same destination not everything is going to the same room. You’ll do yourself a big favor if you don’t mix and match items from different rooms into the same box. That has less to do with moving than it does with unpacking. Obviously, you want tape your boxes very strongly at the bottom and the top. Invest in a good box cutter for unpacking. You will want to label each box with the room that it’s going into. You should also give a brief inventory list as well. Again, this is more to do with unpacking than the moving but it can save you time at the other end. It doesn’t matter if you’re moving into a bigger space or one the same size; you don’t want to bring clutter with you. This usually happens when you rush towards the end of packing. Take your time sorting through all the things and pull out the items that you without. All of that should be turned over the Junk King Dallas Mid Cities. One call to these professional junk haulers and you get all of that clutter removed in a fast appointment. Working with Junk King Dallas Mid Cities insures that you aren’t going to be bringing any clutter with you to your new home. This entry was posted in Dallas Mid City Junk Removal and tagged clutter, junk King Dallas mid cities, junk removal, next move on June 30, 2017 by Junk King. Last updated June 30, 2017 .